Visual Arts students at The Sixth Form College, Solihull travelled to Liverpool this week to get inspiration for their own artwork. 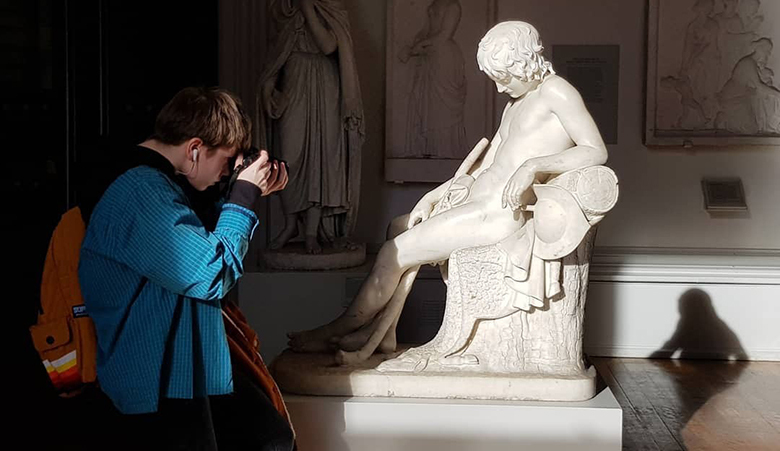 Students on our A level Fine Art, Graphics and Photography courses joined BTEC Art & Design students to visit the Walker Art Gallery and the Tate Liverpool before half-term. The Walker Art Gallery in Liverpool includes an exciting collection of paintings, drawings, sculpture, fashion and decorative art, dating from the Renaissance era to the modern day. Among the artwork on display is sculpture from Degas and Rodin and paintings by Rembrandt, Turner and Monet. Meanwhile, the Tate Liverpool houses modern and contemporary art from around the world, including work from William Blake and Pierre Bonnard. In addition, to visiting these two famous galleries, some students also went to the International Slavery Museum and on the way home stopped off at Crosby Beach to view Antony Gormley’s ‘Another Place’ installation. As well as producing a portfolio of work to be assessed on, students on all four of the Visual Arts courses offered at the College are currently working on live briefs. This means they have 4 weeks to produce a piece of artwork for a client, keeping to a brief provided by that client. Among the briefs, Photography students are photographing flowers for a social media campaign for Solihull florist Fleur de Lis.